Dubai: Etihad Aviation Group confirmed on Monday it is in talks to merge part of Air Berlin with Germany’s TUIfly, a subsidiary of TUI AG, to set up a new European leisure airline group. Etihad Aviation Group, the parent company of Etihad Airways, confirmed the talks in a joint statement with TUI AG after Bloomberg reported on Tuesday that the travel company had written to employees about the proposed merger. Etihad and TUI AG have proposed combining Air Berlin’s tourism business that consists of 35 aircraft, including 14 wet leased from TUIfly by Air Berlin, with TUIfly into a new airline group, the joint statement said. Etihad holds a 29.21 per cent stake in Air Berlin. The new airline, which would be “established by TUI AG and Etihad Aviation Group,” would fly to a “broad network” of destinations from Germany, Austria and Switzerland, the statement said. Air Berlin confirmed in a separate statement on Wednesday that it would join the negotiations. “The prospective transaction will be subject to successful negotiations and to all necessary corporate and regulatory approvals,” Air Berlin said. Details of the merger talks emerged a week after Air Berlin announced a major restructuring on September 29 that includes axing 1,200 jobs and leasing 40 jets to German competitor Lufthansa. “This hook up with TUI would be another way to substantially reduce its fleet and reduce exposure to tough low cost competition,” John Strickland, aviation expert and director of UK-based JLS Consulting, told Gulf News by email. 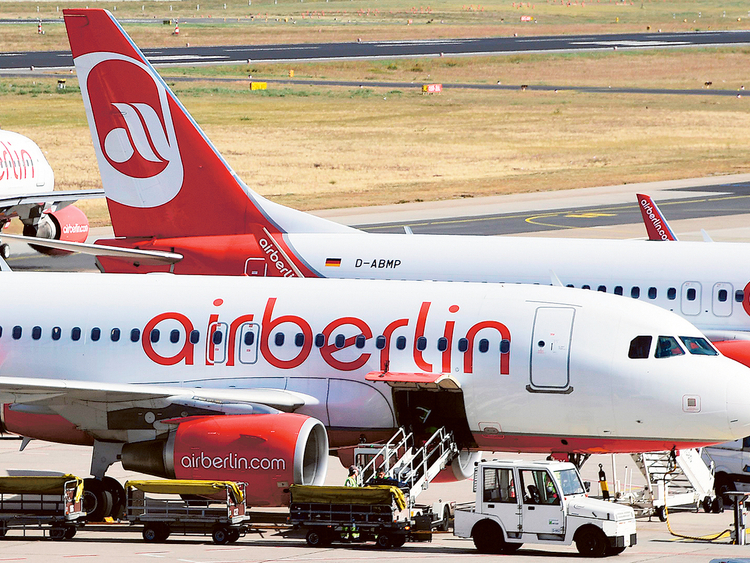 Air Berlin, Germany’s number two airline, has lost over a €1 billion (Dh4.12 billion) in the past three years as it faced increasing competition from Lufthansa and low cost airline’s such as Ryanair. The new airline group would be supported by Etihad’s expertise and make use of TUI’s distribution capacity, the joint statement said. Etihad owns stakes in seven airlines from Australia to Europe, including India’s Jet Airways and Italy’s Alitalia.